I’m fairly certain that I would love anything that has the words cake batter in it! For the kid’s birthday this year I tested out some cake batter recipes and loved them all. The cake batter truffles where, by far, my favorite. 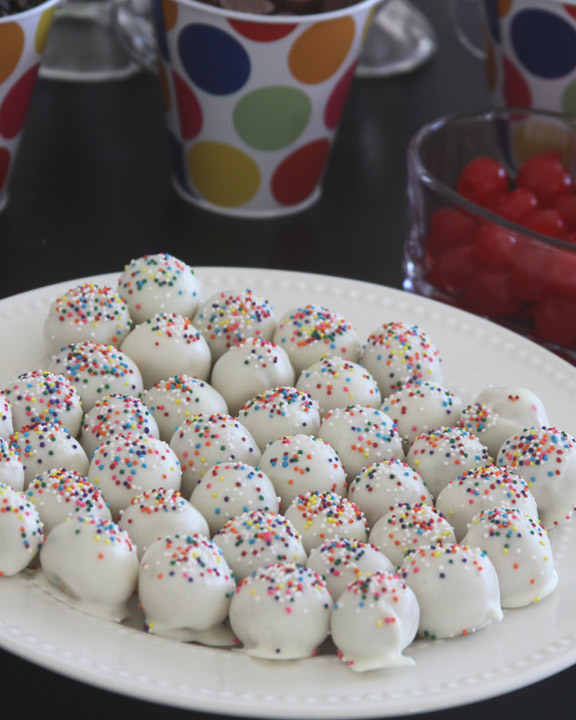 These no bake truffles are easy to make but so hard to stop eating! Last week we celebrated two birthdays in our house. With parties on days that were not on actual birthdays it seems like we partied all week long. I found three great cake batter recipes that I incorporated into our week long birthday celebrations. 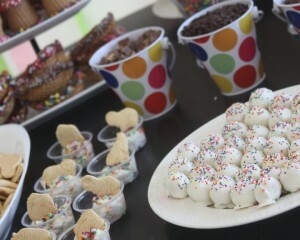 The recipes included a cake batter dip, cake batter pancakes, and cake batter truffles. My son wanted the cake batter pancakes for dinner on his actual birthday which ended up being really fun and special! It was hard to eat birthday cake after eating a plate of sweet tasting cake batter pancakes, but we managed. Not the healthiest of meals I have ever served my kids. It is what he asked for for his birthday dinner – so I was all for it! I made the cake batter dip wrapped in individual bags for my little guy to take to school for snack to celebrate his big day with his friends. My husband loved the cake batter pancakes, my son loved the cake batter dip, and I adored these cake batter truffles. 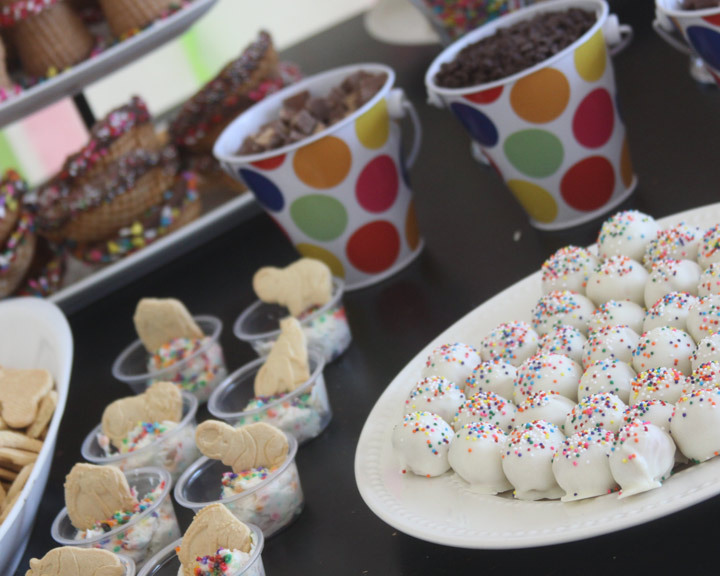 The cake batter truffles were an addition to the ice cream bar that I put together for the kid’s ice cream themed birthday party. I thought that they would look beautiful with their colorful sprinkles on the treat table. 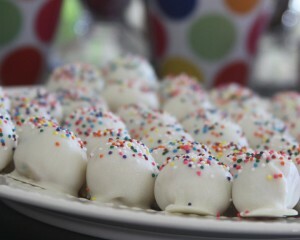 They were so delicious and I will be crossing my fingers that some one will make them for me on my birthday this year. Ha – a girl can dream, right? The recipe is simple and these are so great to pre-make and store in the fridge for any special occasion. There is no baking involved – just mix and dip for this tasty treat. I made these about three days before my kid’s big family birthday party. I stored them in the fridge on a pretty plate after they were finished and simply pulled them out and set them on the table at party time. They are pretty to look at and festive on serving plate for a party! I could not get enough of these. I first saw this recipe on Pinterest via Chef In Training. I used her recipe exactly but had one major substitute. Her recipe called for 16 ounces of almond bark (or white candy melts). Because we live in a small town, our grocery store does not carry specialized things like candy coating, so I had to improvise a little. Of course, I decided I had to make these on a particular day that a trip to another town was not an option. So, I used something that I could find anywhere. I decided I would try them dipped in white chocolate instead of the almond bark. I thought they turned out amazing! I have not tried them with the almond bark yet as a comparison, but why change it if I liked it so much? Anyone would love to receive a plate of these on their birthday! I hope you give this recipe a try and enjoy it as much as I did! Beat butter and sugar using an electric mixer until combined. Blend in vanilla. Add cake mix, flour, salt, and vanilla and mix thoroughly. Add 3 Tablespoons of milk or more if needed to make a dough consistency. Mix in sprinkles by hand. Roll dough into one inch balls and place on a parchment or wax paper lined cookie sheet. Chill balls in the refrigerator for 15 minutes to firm up. While dough balls are chilling, melt white chocolate chips in the microwave in 30 second intervals until melted, stirring between intervals. Using a fork, dip truffles into melted chocolate to coat. Place truffle back on the cookie sheet and top with sprinkles. Repeat until finished. Chill in the refrigerator until serving. Makes around 24-30 truffles.